Aaron Foster's handmade artwork pays homage to guitar-playing legends from coast to coast. From artist Aaron Foster comes this handmade creation evoking legendary guitar-playing singers like Hank Williams, Woody Guthrie and Johnny Cash. 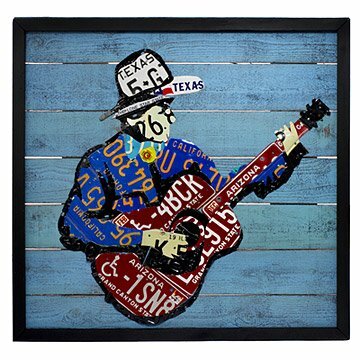 Each part of the singer and his guitar is made from authentic license plates of a different state, mounted on a painted cedar background. Though Foster's favorite guitar player and singer is Bob Dylan, this troubadour could be any of the cowboys throughout the years who have filled the camps and deserts of the West with a song or a tune. Handmade in California. Aaron Foster's art is created with US license plates from all over the country, hand carved into distinct forms and mounted onto a cedar background. His license plate map of the United States has been featured on "Extreme Makeover: Home Edition" on ABC. A native Northern Californian, Aaron spent five years living and working in Atlanta, GA, where he co-founded Relish, a company that represents artists and helps grow their businesses. Surrounded and inspired by all this creativity, he began working his own magic. He began his career with reclaimed wood from old homes and barns, and now works specifically with vintage license plates. Aaron returned to Northern California in 2002 to get back to the landscape he loves and be creative in familiar surroundings, but he has recently relocated again to Southern California to pursue his lifelong dream of being an actor. The varied styles and never ending palette of America's old license plates allow for unlimited color combinations in his work. The license plate map of the United States was inspired partly from his collection of old globes and school maps that fill his eclectic home. Having graduated from the University of California, Davis with a degree in history, the ever-changing old maps and globes provide a glimpse into the continuously changing history of our world. "I always wonder about the history of the vintage plates I use...what roads they may have traveled down already and where they might be headed next." When he's not following Bob Dylan around on tour, you can find him in his Los Angeles studio, snipping, cutting and creating...and sometimes playing his own guitar. I purchased the Guitar Man for my husband's birthday. It came sooner than expected - always a plus! - and it's incredibly beautiful! Definitely make note of the size because it's a large piece and quite heavy so make sure your wall can handle some weight. The picture is the perfect depiction of it but it still doesn't quite do it justice. We get compliments on it anytime someone comes over and sees it for the first time. A great gift for anyone but especially a musician like my husband.